Dentist in Longmont Thanks the Community for Choosing His Practice! It’s been over two decades since Dr. James A. Maurer started practicing in the Longmont area. He’s been doing his best to provide patients a very high standard of care to as many patients as possible. Now, his patients have spoken not just about his dental care, but about his son’s treatment as well. Clearly the apple does not fall far from the tree. Today, Longmont Complete Dentistry thanks its patients for voting it as the best dentist in Longmont! 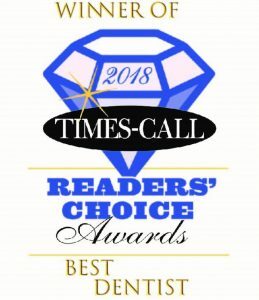 According to Times-Call Magazine, a publication that allows readers to vote on all their favorite businesses in Longmont, has recently published an issue highlighting Longmont Complete Dentistry for earning the “Best Dentist” award. This award is based exclusively on the people in the community who have visited the practice. It is not paid for or campaigned for in any way. This means only the efforts your Longmont dentist has worked hard to provide patients helped him earn this title. For this award, the father and son dental team, as well as the many staff members at the practice, thank the community of Longmont for giving them this honor. At our practice, the team prides itself on providing customized care to each patient. No patient can be given a one-size-fits-all solution. According to Dr. Dan Maurer, the son of Dr. James Maurer who started the practice in 1985, “We are very proud to win the Reader’s Choice Award as best dentist, as it lets us know that our patients truly appreciate the individual service they receive.” Dr. Dan is proud to carry on the tradition his father started decades ago. When you visit Dr. Dan and Dr. James, you won’t just get service with a smile. In fact, they’re prepared to help you handle dental emergencies and schedule early and late appointments throughout the week! Additionally, if you’re a new patient, you can save on your first consultation, exam, and X-rays! All new patients can take advantage of the promotion that provides these services in one package for only $55. It’s just their way of saying thank you to the community for your continued support. To experience the difference Longmont Complete Dentistry offers, schedule an appointment today! Dr. Dan Maurer has always been driven to help others get the care they need. After watching his father serve the Longmont community for so many years, he knew he wanted to follow the tradition and earned his DDS degree from the University of Colorado School of Dental Medicine. To learn more about your dentist in Longmont or about his practice, feel free to contact him through his website. Comments Off on Dentist in Longmont Thanks the Community for Choosing His Practice!